When we talk about the City of London, we are talking about both a place and an idea. The City is the square mile that was once a fortified town founded by the Romans, that developed into the heaving moiling medieval trading centre on the banks of the River Thames, burnt down in 1666, rebuilt by Wren, bombed in the Blitz and today is a dense cluster of shining towers interspersed with beautiful jewel box churches. The City is also the financial district, and so it’s the UK equivalent of Wall Street, a place where millions of pounds are lost and won every day by adrenaline-driven traders, where deals are brokered and where a bonus might buy you a castle or two in Scotland. That City is not confined to the Square Mile any more but spread across the whole of London. London likes to think of itself as the most important financial centre on the planet. Until last week that might actually have been true. It’s certainly the biggest in Europe. Being a half-way house between New York and the Far East has made the City an essential stop-over for global trading, and London is also the English-speaking bridge between Europe and America. Signing the charter for the Bank. How did London become such a huge trading centre? Well, obviously it has the historical advantage of trade and empire, but the real kick recently came with the so-called Big Bang in 1986 when the City was deregulated. Since then, it’s been one long moneymaking ride with a few dips around the 1988, the dotcom bubble in the early noughties, and the credit crunch 2008. Then two days ago, it was revealed that Barclays, one of the oldest, biggest, most respected banks in Britain and the world, had been fiddling the figures. I have three charts for the City, two of which have unknown times. 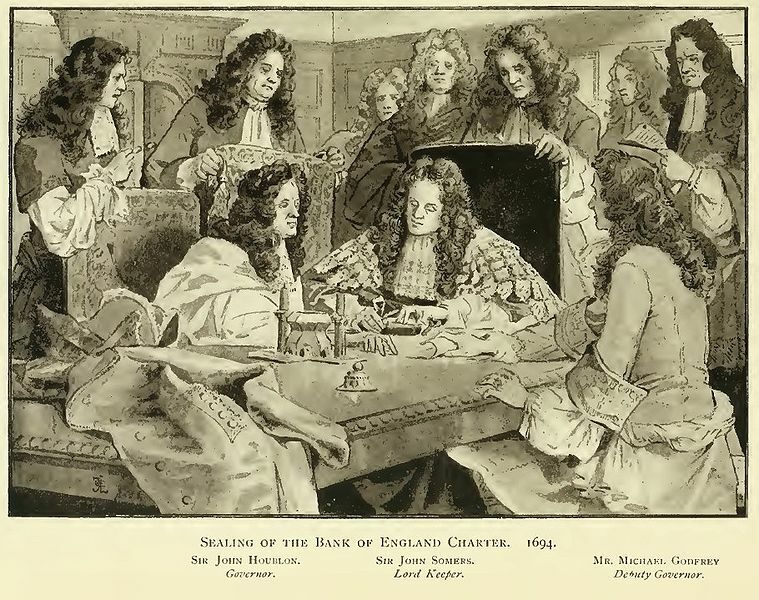 The first is for the Bank of England, which was chartered to fund the Crown in 1694. The second is for the founding of the London Stock Exchange in 1801 and the third is for the Big Bang. All three charts have Sun conjunct Pluto. If you ever had any doubts that Pluto, the god of the Underworld, rules vast wealth, then I think you can put them to rest now. 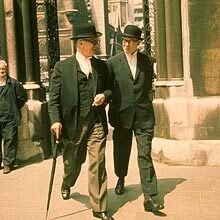 The Bank of England actually has Jupiter, Pluto and the Sun in Leo, the sign of gold, and indeed those were the days when money equalled gold. Leo is also the sign of kings, as is Jupiter the planet of kings, as this was money to pay the king. The North Node there is in Capricorn conjuncting Saturn. The aim of the Bank was stability. Another remarkable point in common between the Bank of England chart and the Stock Exchange is the Libra Moon. The symbol of Libra is the money-changer’s scales. The Moon is said to be the public in a mundane chart, and also public opinion. Those Libra Moon’s are currently both being jazzed by the Uranus-Pluto square and are probably still under the shadow of Saturn. In October, Saturn moves into Scorpio but far from taking the pressure off, it may be more as if the lid comes off. The chart that’s currently being most affected by the current transits is the London Stock Exchange, which was founded on 3 Mar 1801. This means it was born just two months after the “United Kingdom”. 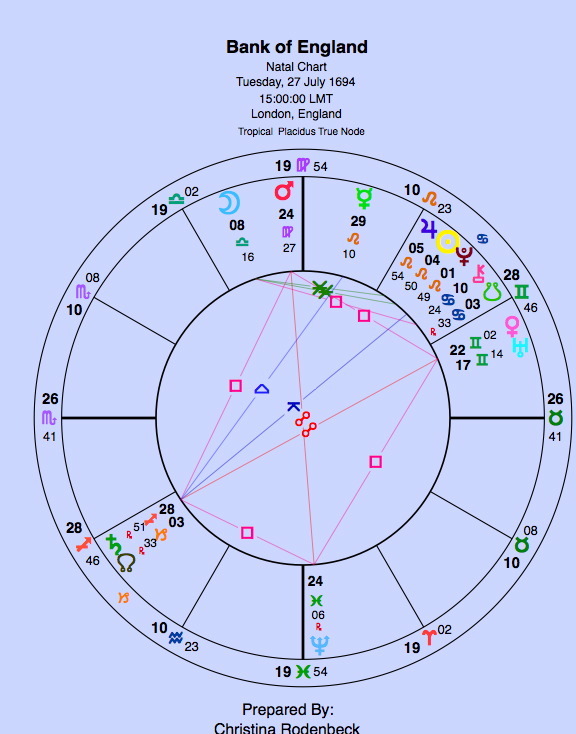 A lot of astrologers, including me, use the 1 Jan 1801 chart for the UK. The thing I find most remarkable is the fact that the North Node is at 9° Aries, a degree which has been under pressure from the Uranus-Pluto square. Uranus, the planet of change, shock and upheaval, is on this point for the first time since 1929. The North Node shows the direction, the destiny, the karma of a chart, and here it is being repeatedly hit. And here’s another historical parallel, Neptune, the planet that sows confusion, the planet of deceit, fog, miasma, is applying to the Stock Exchange Pluto for the first time since the 1870s. What happened then? That was the start of what’s known as the Long Depression, a period of economic woe that lasted for the following decade and more. It’ll be interesting to see what happens as Neptune passes through Pisces, often a rather deceitful sign, and contacts the Stock Exchange Sun in a few years time. This can be a moment of dissolution. Venus has just stationed direct just one degree from the Stock Exchange Mars. Mars shows us where the action is, and obviously it’s in trading, for is the purview of Gemini. 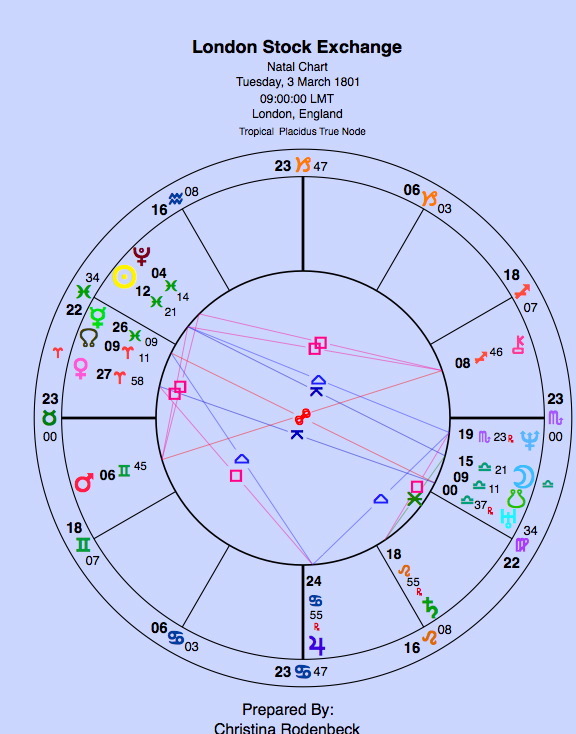 Finally, take a look at the chart for the Big Bang, which does have a time, which appropriately gives it Venus (money) rising in Scorpio, which is ruled by Pluto in the 12th, already that latter placement smacks of potential criminality. The Moon is in golden Leo this time, and “swagger”is exactly what we associate with the current incarnation of the City. Like the Bank of England, the Big Bang’s Sun-Pluto is in a fixed sign, strong but brittle, unlike the infinitely flexible Exchange’s planets in slippery Pisces. What’s really serious about the revelations this week is that the figure fiddling could destroy the reputation of the City of London. What’s been revealed is that Barclays traders manipulated the LIBOR rate, by lying about how much interest they were paying. This interest rate is calculated daily and used to set other interest rates all over the world – including possibly your very own mortgage. London used to have a reputation for a certain amount of honesty and integrity (within limits, of course), of institutions that worked. If this reputation is destroyed, London may no longer be seen as a safe place to do business. That reputation, signified by those Libra Moons, is wobbling. The direction of the Exchange is about to take a turn, signified by the North Node, dissipation and confusion may follow signified by the Neptune transit. However, the Sun is Pisces has a tendency to pull through almost anything, so in the long-term the Exchange will pull through, but not after a serious reorganisation, likely when Saturn hits the Big Bang Sun in October (always a hairy month in the City). It’s likely then that the deregulation of 1986 will be redrawn. For a look at the transits on the day the LIBOR swindle was “revealed”, click here. There are also some good comments on that post. 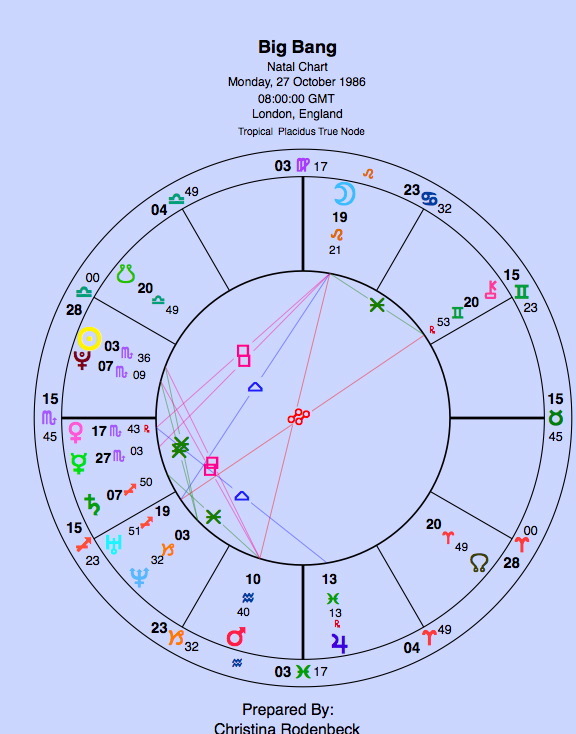 Re Stock Exchange chart, Chiron has also just stationed retrograde at 9 Pisces – roughly at the midpoint of the Sun/Pluto conjunction and quincunx the South Node (consequences of past actions). The organisation is wounded. Chiron hangs around this area all the way through 2013 and beyond. Taken along with the Neptune transit – and everything else – and we might indeed see mortal wounding and dissolution. I wonder if some kind of healing will follow though? Yes – I wonder that too – and I think it is likely because of the Pisces flavour of the institution and the whole transit & Pisces is such a survivor. Also if you look at the history of the Stock Exchange, it’s gone through some shocking patches but come back. It’s strength likes in it’s flexibility. We could be talking about necessary sacrifice, also a Neptune-Pisces theme. Maybe people or practices will be put on the altar of public good. After googling ‘Carry On Banking’ (it’s the 1st Anon here)I found a link to a BBC 2010 piece – HSBC and Royal Bank of Scotland had already been bailed out by the taxpayer then – what they did was to simply continue on in exactly the same way, just re-naming what they were doing. And now they expect another bailout.. I also found out that risk assessment on investments accounts for 3/4 of the global economy (well that obviously worked). Here’s a clip from Bird and Fortune explaining the sophisticated nature of the Investment Market mindset..
Oops sorry, that was 2/3 size of global economy, not 3/4. (Found that out from another Bird and Fortune Video). So that’ll be risk assessment with no idea of what the risk is. It’s quicksand. I looove Bird and Fortune. they survive because they bet on both sides. Obviously if one side loses the other wins. They profit in both good times and bad times. Its all gravy to them. Just look at how well the stock market has done since 2008. I was actually a Risk Manager in a Mental Health NHS Trust – as far as I can see my job was a lot clearer. And that’s saying something. Batching up all dodgy financial risks with other risks according to some strange financial logorithm and then selling it on (and on and on) until nobody knows what they’ve bought or who’s paying what (or what it’s worth)- you may as well throw a coin up in the air. Giving money to the same institutions that got us into trouble in the first place, without corporate or financial controls on what they’re doing – of course they’re just going to do it again – that’s all they know. Funny money for sure. Yes and Bird and Fortune are brilliant! !